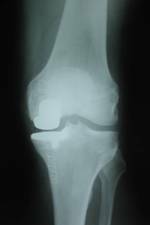 Occasionally patients can present with arthritis of the knee only affecting one side of the joint rather than all over the knee. Studies have suggested that up to 25% of patients with osteoarthritis of the knee have mostly wear and tear affecting the inside of the knee joint or the medial side. Less commonly only the outside part of the knee can be affected. 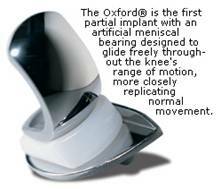 One surgical option for such a pattern of arthritis is a unicompartmental knee replacement (or the ‘Oxford’ knee). This removes the small area of symptomatic arthritis leaving the undamaged part of the knee alone. The operation involves a smaller incision on the inside of the knee about 8-10cm long compared to a total knee replacement. This has the benefits of reduced blood loss, shorter hospital stay (2-3 days) and a speedier recovery. The range of knee movement after unicompartmental knee replacement is generally a little better than that after total knee replacement. It is also accepted that if arthritis develops in the rest of the knee, revision of a unicompartmental knee replacement to a total knee replacement is more straightforward than revision of a total knee replacement. However before considering a unicompartmental knee replacement it is important to make sure that the knee is stable (intact cruciate ligaments) and that the knee can almost fully straighten and flex to more than ninety degrees. It is also important that there is not too much bow-leggedness and that there is minimal arthritis affecting the undersurface of the patella and the rest of the knee. Recent studies have reported survivorship rates for Oxford unicompartmental knee replacements of between 95% and 98% at 10 years. A recent systematic review of the evidence supports the use of this particular implant in patients with arthritis of the medial compartment provided the indications are fulfilled. Mr Rees currently offers the Oxford unicompartmental knee replacement for carefully selected patients.